CONSOLIDATION WAS THE RECURRING theme in 2017 Canadian M&A. In certain sectors facing disruptors and high costs (such as crop nutrients and investment fund management) it took two large competitors to team up. In other sectors (gold mining, for example, and REITs), it meant two purchasers coming together to acquire at least a third company. On these mandates, lawyers needed to help their purchaser clients align their respective interests, which were not identical. Here they are then, the Top 10 Deals of 2017. For an explanation of our methodology, click here. 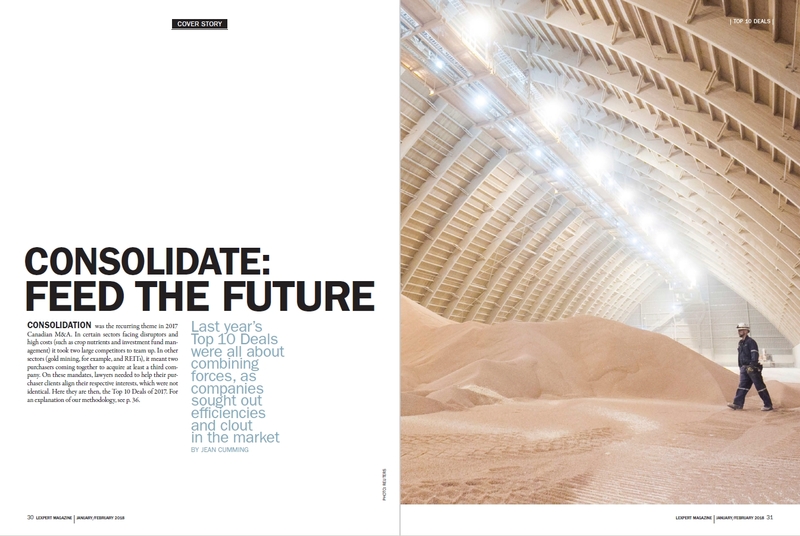 This merger of equals was announced by Potash Corp. of Saskatchewan Inc. and Agrium Inc. in 2016, when commodity markets were stagnating, with the anticipation of $500 million per annum in cost savings. The deal closed on January 2, when the newly merged entity, Nutrien Ltd., began trading on the TSX and NYSE. Bill Braithwaite led the team at Stikeman Elliott LLP, which included Mike Devereux, for PotashCorp and its General Counsel, Joe Podwika. These two Canadian crop nutrient producers, with some differing and some overlapping products, are global in scale and operation. And so the regulatory hurdles involve several jurisdictions and entities, including the US, China and India. On closing, the two merged to create Nutrien, a manufacturing, wholesale and retail business with an enterprise value of $36 billion. Stocks of both companies rose in the third quarter of 2017. Michael Kandev, who led the Tax team for PotashCorp at Davies Ward Phillips & Vineberg LLP with Nathan Boidman, elaborated: “Conceptually, a merger of equals can be effected contractually or structurally. The former would see each corporate group remain legally separate but ‘merged’ by contractual agreements including profit equalization arrangements. A corporate-structural merger was instead chosen by PotashCorp and Agrium. “A corporate merger could be effected in several ways, but ultimately the parties’ commercial and business objectives were best reflected in a structure involving the establishment of a new top holding publicly listed corporation, called Nutrien Ltd., that would directly and indirectly acquire PotashCorp and Agrium with their shareholders emerging as shareholders of Nutrien Ltd. The deal closing was pushed to the end of 2017 to allow Competition regulators in various jurisdictions to review the deal. According to the companies’ joint press release: In Canada and the United States, the parties worked with the Canadian Competition Bureau and the Federal Trade Commission to resolve final issues in superphosphoric acid (SPA) and nitric acid. The companies have also been informed that the Ministry of Commerce (MOFCOM) in China and, independently, the Competition Commission of India (CCI) conditioned their respective approvals of the proposed transaction on the divestment of certain of PotashCorp’s offshore minority ownership interests. The remedies under consideration are not expected to impact the estimated $500-million of annual operating synergies. As the largest global provider of crop inputs and services, Nutrien will play a critical role in ‘Feeding the Future’ by helping growers to increase food production in a sustainable manner. Calgary-based Cenovus Energy Inc. was “bulking up in a $17.7-billion deal to more than double its production as the repatriation of Canada’s oil sands winnows control of the resource to a handful of domestic players,” according to The Globe and Mail. Total Energy Services Inc., a diversified oilfield services company based in Calgary, purchased all of the outstanding common shares of another Calgary-based oilfield services company, Savanna Energy Services Corp., by way of an unsolicited takeover bid on December 9, 2016. On March 1, 2017, Total filed a Notice of Change and Notice of Variation to the Offer to, inter alia, increase the consideration payable for each Savanna Share to $0.20 in cash plus 0.13 of a Total common share. On March 9, 2017, Savanna announced that it had entered into an agreement with another publicly traded oilfield services company, whereby such company would acquire all of the Savanna Shares pursuant to a plan of arrangement. Notwithstanding this competing transaction, on March 24, 2017, Total acquired 60,952,797 Savanna Shares under the Offer, representing approximately 51.6 per cent of the total number of outstanding Savanna Shares, and extended the Offer to April 7, 2017, in accordance with Canadian securities laws. The Offer was subsequently extended to April 27, 2017. According to Marketwired’s release, “OneREIT is an unincorporated, open-end real estate investment trust with more than C$1 billion of total assets. It owns and manages 56 properties across 10 provinces and territories in Canada covering 7 million square feet. “SmartREIT is one of Canada’s largest real estate investment trusts with total assets of approximately C$8.9 billion. It owns and manages 32 million square feet in value-oriented, principally Walmart-anchored retail centres. 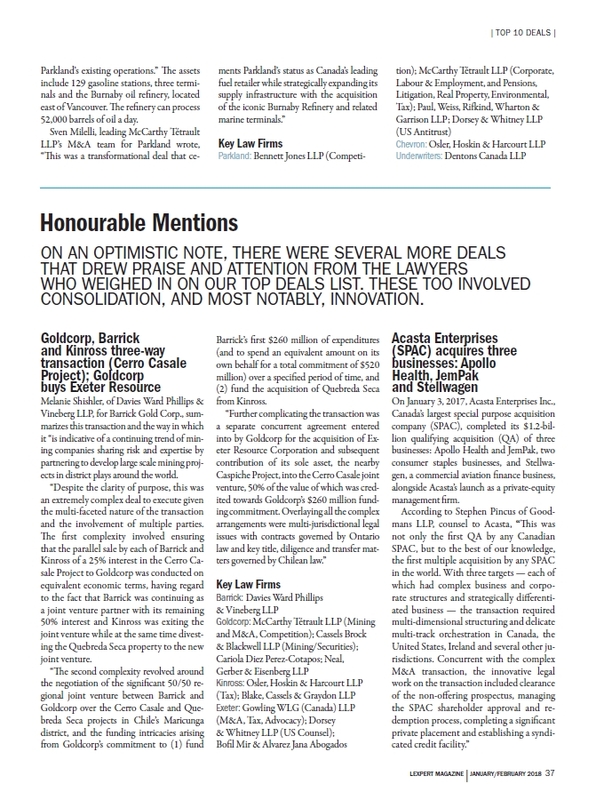 Sticking with our consolidation theme, this time globally, the Nortel case/deal was re-fuelled by an infusion in 2011 that took most observers by surprise. As reported at the time in The Guardian, “The Apple, Microsoft, Sony and BlackBerry maker Research in Motion are part of a winning consortium of six companies which have bought a valuable tranche of patents from the bankrupt Nortel Networks patent portfolio for $4.5bn (£2.8bn), in a hotly contested auction that saw Google and Intel lose out.” There was something to settle with, in other words. D.J. Miller, a partner at Thornton Grout Finnigan LLP offers this explanation for why the decision made the deal: “The Global Settlement in Nortel announced on October 12, 2016, became somewhat inevitable after the Ontario Court of Appeal (OCA) issued 42-page written Reasons on May 3, 2016, dismissing an application by the bondholders and US debtor estate for leave to appeal the pro rata allocation decisions issued by the Canadian and US Courts. The very strong OCA decision led to the first level appeal court in Delaware, which had already heard the appeal but hadn’t issued a decision, referring the matter directly to the highest appeal court in Delaware for determination. Had a US Appeal Court reached a different conclusion than the OCA, it would have left the parties in limbo with no means to allocate the $7.3 billion in global proceeds and further costs being incurred, since any allocation required a consistent decision of the Canadian and US Courts. This would have been an ‘Armageddon’ scenario for creditors, who had already waited seven years with no distribution. Another perennial favourite on Lexpert lists is the restructuring of Stelco Inc.. It had been operating under the protection of the Companies’ Creditors Arrangement Act (CCAA) since being granted an initial stay of proceedings in September of 2014. On June 9, 2017, the court approved its restructuring under the CCAA. On June 30, Bedrock Industries Group LLC announced that all of the closing conditions regarding its announced transaction had been satisfied and its acquisition of Stelco was closed. Bedrock plans to continue steel operations, and approximately 2,200 existing jobs would continue at Stelco’s Hamilton and Lake Erie facilities. The Restructuring plan also has the necessary support from Stelco creditors, including the province, and Stelco employees. The company will now work with stakeholders to finalize the necessary supporting agreements. The restructuring plan is supported by a Memorandum of Understanding (MOU) between Bedrock and the Province of Ontario, which sets out a policy framework intended to protect jobs while allowing the continuation of pensions and other post-employment benefits (OPEBs). The MOU also protects the environment while providing the opportunity for Stelco’s lands to be used to create value for pensions and OPEBs. On an optimistic note, there were several more deals that drew praise and attention from the lawyers who weighed in on our top deals list. These too involved consolidation, and most notably, innovation. Closing the list of Top 10 on the consolidation theme, Chevron Corp., the second-largest US-based oil company, sold its Canadian gasoline stations and refinery in British Columbia to Parkland Fuel Corp., a marketer of petroleum products, for $1.46 billion. In a Reuters report, Parkland CEO Bob Espey said, “The acquisition adds scale to Parkland and gives the company significant supply infrastructure and logistics capability to support Parkland’s existing operations.” The assets include 129 gasoline stations, three terminals and the Burnaby oil refinery, located east of Vancouver. The refinery can process 52,000 barrels of oil a day.